Google’s Stadia is an impressive piece of engineering to be sure: Delivering high definition, high framerate, low latency video to devices like tablets and phones is an accomplishment in itself. But the game streaming services faces serious challenges if it wants to compete with the likes of Xbox and PlayStation, or even plain old PCs and smartphones. Here are our nine biggest questions about what the service will be and how it’ll work. 1. What’s the game selection like? 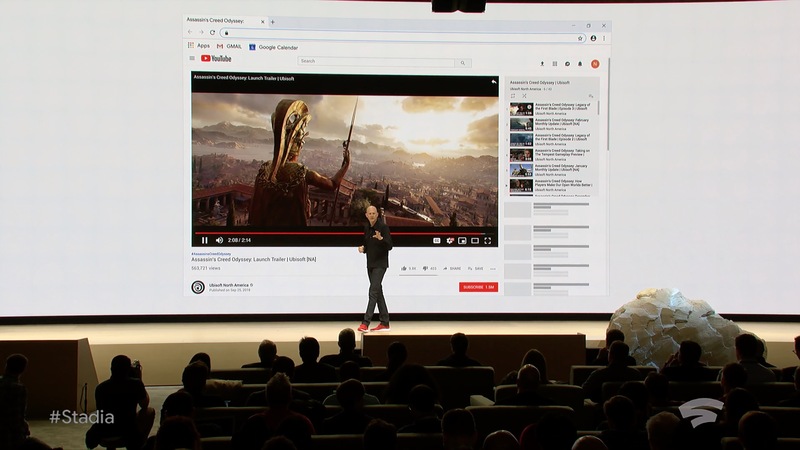 We saw Assassin’s Creed: Odyssey (a lot) and Doom: Eternal, and a few other things running on Stadia, but otherwise Google’s presentation was pretty light on details as far as what games exactly we can expect to see on there. It’s not an easy question to answer, since this isn’t just a question of “all PC games,” or “all games from these 6 publishers.” Stadia requires a game be ported, or partly recoded to fit its new environment — in this case a Linux-powered PC. That’s not unusual, but it isn’t trivial either. What that tells me is that every game that comes to Stadia will require special attention. That’s not a good sign for selection, but it does suggest that anything available on it will run well. 2. What will it cost? Perhaps the topic Google avoided the most was what the heck the business model is for this whole thing. Do you pay a subscription fee? Is it part of YouTube or maybe YouTube Red? Do they make money off sales of games after someone plays the instant demo? Is it free for an hour a day? Will it show ads every 15 minutes? Will publishers foot the bill as part of their normal marketing budget? No one knows! It’s a difficult play because the most obvious way to monetize also limits the product’s exposure. Asking people to subscribe adds a lot of friction to a platform where the entire idea is to get you playing within 5 seconds. Putting ads in is an easy way to let people jump in and have it be monetized a small amount. You could even advertise the game itself and offer a one-time 10 percent off coupon or something. Then mention that YouTube Red subscribers don’t see ads at all. Sounds reasonable, but Google didn’t mention anything like this at all. We’ll probably hear more later this year closer to launch, but it’s hard to judge the value of the service when we have no idea what it will cost. 3. What about iOS devices? Google and Apple are bitter rivals in a lot of ways, but it’s hard to get around the fact that iPhone owners tend to be the most lucrative mobile customers. Yet there were none in the live demo and no availability mentioned for iOS. Depending on its business model, Google may have locked itself out of the App Store. Apple doesn’t let you essentially run a store within its store (as we have seen in cases like Amazon and Epic) and if that’s part of the Stadia offering, it’s not going to fly. An app that just lets you play might be a possibility, but since none was mentioned, it’s possible Google is using Stadia as a platform exclusive to draw people to Pixel devices. That kind of puts a limit on the pitch that you can play on devices you already have. 4. What about games you already own? A big draw of game streaming is to buy a game once and play it anywhere. Sometimes you want to play the big awesome story parts on your 60-inch TV in surround sound, but do a little inventory and quest management on your laptop at the cafe. That’s what systems like Steam Link offer. Epic Games is taking on Steam with its own digital game store, which includes higher take-home revenue rates for developers. But Google didn’t mention how its ownership system will work, or whether there would be a way to play games you already own on the service. This is a big consideration for many gamers. It was mentioned that there would be cross platform play and perhaps even the ability to bring saves to other platforms, but how that would work was left to the imagination. Frankly I’m skeptical. Letting people show they own a game and giving them access to it is a recipe for scamming and trouble, but not supporting it is missing out on a huge application for the service. Google’s caught between a rock and a hard place here. 5. Can you really convert viewers to players? This is a bit more of an abstract question, but it comes from the basic idea that people specifically come to YouTube and Twitch to watch games, not play them. Mobile viewership is huge because streams are a great way to kill time on a train or bus ride, or during a break at school. These viewers often don’t want to play at those times, and couldn’t if they did want to! So the question is, are there really enough people watching gaming content on YouTube who will actually actively switch to playing just like that? To be fair, the idea of a game trailer that lets you play what you just saw five seconds later is brilliant. I’m 100 percent on board there. But people don’t watch dozens of hours of game trailers a week — they watch famous streamers play Fortnite and PUBG and do speedruns of Dark Souls and Super Mario Bros 1. These audiences are much harder to change into players. The potential of joining a game with a streamer, or affecting them somehow, or picking up at the spot they left off, to try fighting a boss on your own or seeing how their character controls, is a good one, but making that happen goes far, far beyond the streaming infrastructure Google has created here. It involves rewriting the rules on how games are developed and published. We saw attempts at this from Beam, later acquired by Microsoft, but it never really bloomed. Streaming is a low-commitment, passive form of entertainment, which is kind of why it’s so popular. Turning that into an active, involved form of entertainment is far from straightforward. 6. How’s the image quality? Games these days have mind-blowing graphics. I sure had a lot of bad things to say about Anthem, but when it came to looks that game was a showstopper. And part of what made it great were the tiny details in textures and subtle gradations of light that are only just recently possible with advances in shaders, volumetric fog, and so on. Will those details really come through in a stream? Don’t get me wrong. I know a 1080p stream looks decent. But the simple fact is that high-efficiency HD video compression reduces detail in a noticeable way. You just can’t perfectly recreate an image if you have to send it 60 times per second with only a few milliseconds to compress and decompress it. It’s how image compression works. For some people this won’t be a big deal. They really might not care about the loss of some visual fidelity — the convenience factor may outweigh it by a ton. But there are others for whom it may be distracting, those who have invested in a powerful gaming console or PC that gives them better detail at higher framerates than Stadia can possibly offer. It’s not apples to apples but Google has to consider these things, especially when the difference is noticeable enough that game developers and publishers start to note that a game is “best experienced locally” or something like that. 7. Will people really game on the go? I don’t question whether people play games on mobile. That’s one of the biggest businesses in the world. But I’m not sure that people want to play Assassin’s Creed: Odyssey on their iPa… I mean, Pixel Slate. Let alone their smartphone. Games on phones and tablets are frequently time-killers driven by addictive short-duration game sessions. Even the bigger, more console-like games on mobile usually aim for shorter play sessions. That may be changing in some ways for sure but it’s a consideration, and AAA console games really just aren’t designed for 5-10 minute gaming sessions. Add to that that you have to carry around what looks like a fairly bulky controller and this becomes less of an option for things like planes, cafes, subway rides, and so on. Even if you did bring it, could you be sure you’ll get the 10 or 20 Mbps you’ll need to get that 60FPS video rate? And don’t say 5G. If anyone says 5G again after the last couple months I’m going to lose it. Naturally the counterpoint here is Nintendo’s fabulously successful and portable Switch. But the Switch plays both sides, providing a console-like experience on the go that makes sense because of its frictionless game state saving and offline operation. Stadia doesn’t seem to offer anything like that. In some ways it could be more compelling, but it’s a hard sell right now. 8. How will multiplayer work? Obviously multiplayer gaming is huge right now and likely will be forever, so the Stadia will for sure support multiplayer one way or another. But multiplayer is also really complicated. It used to be that someone just picked up the second controller and played Luigi. Now you have friend codes, accounts, user IDs, automatic matchmaking, all kinds of junk. If I want to play The Division 2 with a friend via Stadia, how does that work? Can I use my existing account? How do I log in? Are there IP issues and will the whole rigmarole of the game running in some big server farm set off cheat detectors or send me a security warning email? What if two people want to play a game locally? Many of the biggest gaming properties in the world are multiplayer focused, and without a very, very clear line on this it’s going to turn a lot of people off. The platform might be great for it — but they have some convincing to do. Branding is hard. Launching a product that aims to reach millions and giving it a name that not only represents it well but isn’t already taken is hard. But that said… Stadia? I guess the idea is that each player is kind of in a stadium of their own… or that they’re in a stadium where Ninja is playing, and then they can go down to join? Certainly Stadia is more distinctive than stadium and less copyright-fraught than Colosseum or the like. Arena is probably out too. If only Google already owned something that indicated gaming but was simple, memorable, and fit with its existing “Google ___” set of consumer-focused apps, brands, and services.